If you have ever experienced a real New York bagel, you will know that the bagels sold in the frozen food section of most supermarkets pale in taste and texture. Boiling the bagels in water before baking them is what gives them their distinctive, chewy texture. 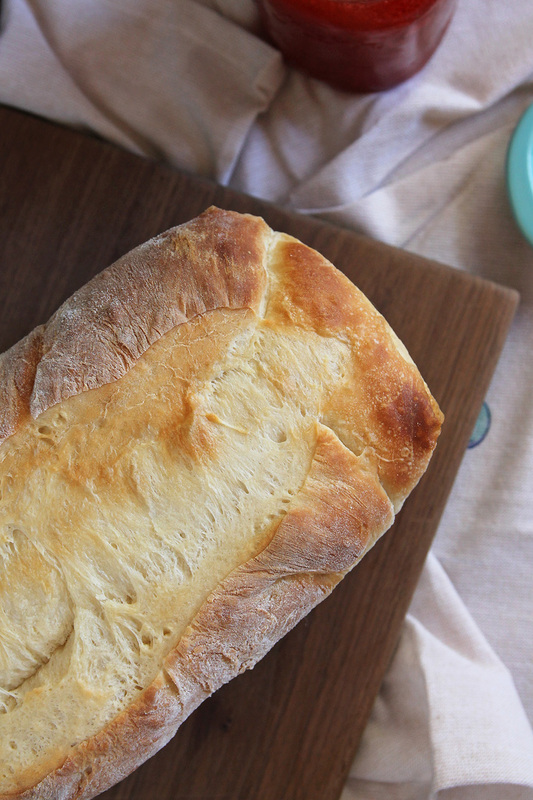 Bread Machine Method: Have liquid ingredients at 80º F and all others at room temperature. Place ingredients in pan in the order listed. Select dough/manual cycle. Do not use the delay timer. Check dough consistency after 5 minutes of kneading. The dough should be in a soft, tacky ball. If it is dry and stiff, add water, ½ to 1 tablespoon at a time. If it is too wet and sticky, add 1 tablespoon of flour at a time. When cycle is complete, remove dough and continue with the directions under the Shaping, Rising and Baking section below. See our Bread Machine section for more helpful tips and information. Hand-Held Mixer Method: Combine yeast, 1 cup flour, salt and sugar in mixing bowl. Add warm water (120-130º F, very warm, but not too hot to touch) to flour mixture in mixing bowl. Mix on low speed. Beat 2 to 3 minutes on medium speed. Using a dough whisk or wooden spoon, stir in enough remaining flour to make a firm dough. Knead on floured surface 5 to 7 minutes or until smooth and elastic. Use additional flour if necessary. Place dough in lightly oiled bowl and turn to grease top. Cover; let rise until dough tests ripe, about an hour. Continue with the directions under the Shaping, Rising and Baking section below. Standard Mixer Method: Combine yeast, 1 cup flour, salt and sugar to mixer bowl. Add warm water (120-130º F, very warm, but not too hot to touch) to flour mixture in mixer bowl. Mix with paddle attachment for 4 minutes on medium speed. Switch to dough hook attachment. Gradually add remaining flour and knead 5 to 7 minutes until smooth and elastic. Place dough in lightly oiled bowl and turn to grease top. Cover; let rise until dough tests ripe, about an hour. Continue with the directions under the Shaping, Rising and Baking section below. Food Processor Method: Have all ingredients at room temperature. Combine yeast, 1 cup flour, salt and sugar. Put flour mixture in processing bowl with steel blade. While motor is running, add water. Process until mixed. Continue processing, adding remaining flour until dough forms a ball. Place dough in lightly oiled bowl and turn to grease top. Cover; let rise until dough tests ripe, about an hour. continue with the directions under the Shaping, Rising and Baking section below. Turn dough onto lightly floured surface; punch down to remove air bubbles. Divide dough into 4 equal parts and each part into 3 equal pieces. Shape each piece into a smooth ball. Poke a hole in the center with a finger. Pull dough gently to make a 1 to 2-inch hole. Place on greased or silicone-lined cookie sheet. Cover, let rise for 15-30 minutes. In a large pot, heat 2 quarts water and 2 tablespoons sugar to boiling. Preheat oven to 375ºF. Place a few bagels at a time in the boiling water. Simmer 3 minutes, turning once half way through. Remove with a slotted spoon. Place back on prepared cookie sheet. Brush tops with 1 slightly beaten egg white; sprinkle with poppy or sesame seeds if desired. Bake in oven 20 to 25 minutes or until golden brown. Let cool on wire rack. Serve with your favorite spread. If an egg bagel is preferred, reduced water to ¾ cup and add 1 egg at room temperature. Just a quick question. KitchenAid’s website states that 2 minutes of kneading on speed 2 will account for 10-12 minutes of kneading by hand. They state not to knead for more than 2 minutes in the stand mixer. Can you elaborate on if we should still be kneading for this long in a stand mixer? Or stick with the 2 minutes? There are many factors to consider when kneading a dough and how long to knead- including the recipe/ingredients, size of the dough, strength of mixer, etc. There really is not a standard ‘time’ that should be standard for all doughs. The best way to determine when your dough is kneaded enough is to check the dough for the gluten window (https://redstaryeast.com/yeast-baking-lessons/baking-steps-guide/kneading/). I made Japanese style bagels based on these recipe. The recipe is at http://desigrub.com/2012/08/furikake-bagels/ Great if you could link to us!